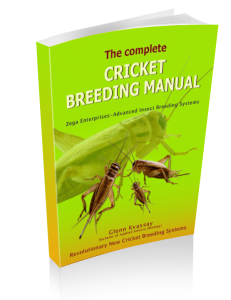 When you purchase any Cricket Breeding book (electronic, paperback or combo deal), you receive free videos how to build our “Zega Substrate System” which is perfect for private use or small scale commercial production. 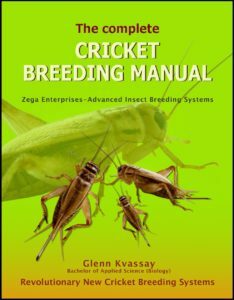 There are no videos for our Large Scale Cricket Breeding Method however the book covers this method in great detail. Our books are available electronically (instant download) or as paperback books and we include complimentary email and video support (Skype or Facebook live). Crickets used to be the hardest species of insect to breed with 98% of people giving up after a few months due to a laborious maintenance schedule. Now they are one of the easiest with an unique detritus collection system not only collects waste for you, it also; eliminates odors; prevents contamination of eggs; increased production and makes cleaning very quick and easy. This is just one innovation, there are many more. The Complete Cricket Guide is available in either paperback version or as a digital download via the links below …. Cockroaches breed so well…so it’s a real shame they can me so messy and smelly to manage. You have probably been there…constant, feeding, cleaning and spraying. Then you have to contend with the odors and escapees. 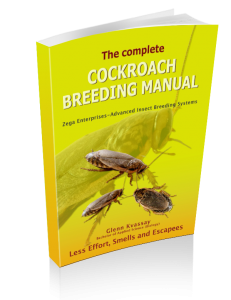 The Complete Cockroach Guide is available in either paperback version or as a digital download via the links below …. Save by grabbing both our Complete Cricket Breeding and our Complete Cockroach Breeding Guides in this great combo. Available in either Paperback (Full Colour) or as an electronic downloadable pdf via the links below ….